There is an unbelievably beautiful and rich world, with a variety of life that goes largely unnoticed by all, until a certain boundary is breached and we awake to the unconventional work of Gaby Wormann. Precision, insects and gears do mix in nature as proven by Issus coleoptratus. This three-millimetre long hopping insect uses toothed gears on its joints to synchronise the kicks of its hind legs as it jumps forward. Gear-like structures are also found on larger animals such as the spiny turtle or the wheel bug, but in those cases, they are purely ornamental. 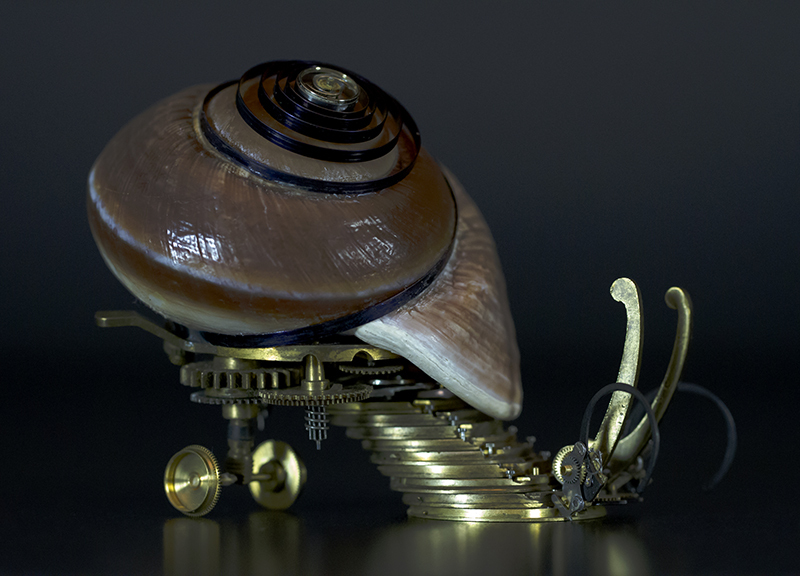 Blending the fragility of life with delicate mechanical elements is sure to provoke a reaction. Some would want to move very far from them, however others would probably touch their noses to them if they were in some cases not kept safely behind glass enclosure. Gaby combines some of the favorite things in life of the founders of Luxfanzine. We will happily pin her work to our wall of quirky and clever inspirations next to steampunk, automatons, and surrealism. Gaby is interested in all things created by the Evolution, going back all the way to dinosaurs and fossils, as well as science-fiction – obviously. Traditionally educated in practical and business areas; her art education was autodidactic and “school of life”. 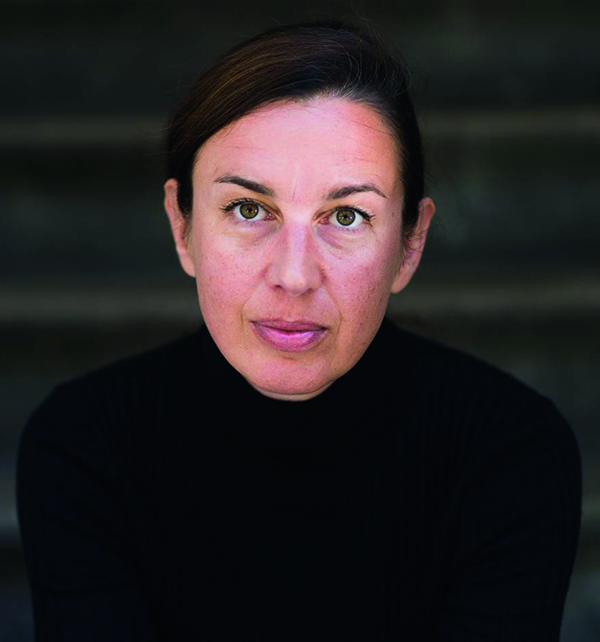 We, in turn, are interested in her work and hoped to find out a little bit more about the person behind MeCre. 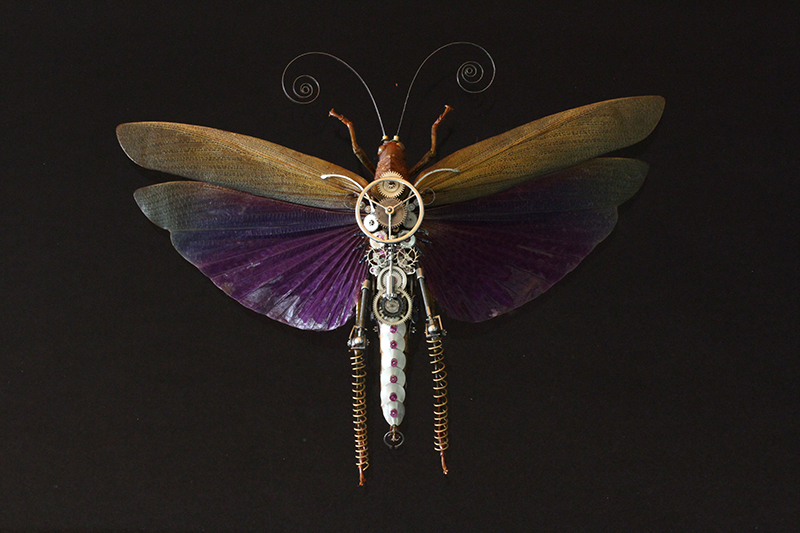 Her art gives us an unusual perspective of the beauty of combining natural with mechanical. 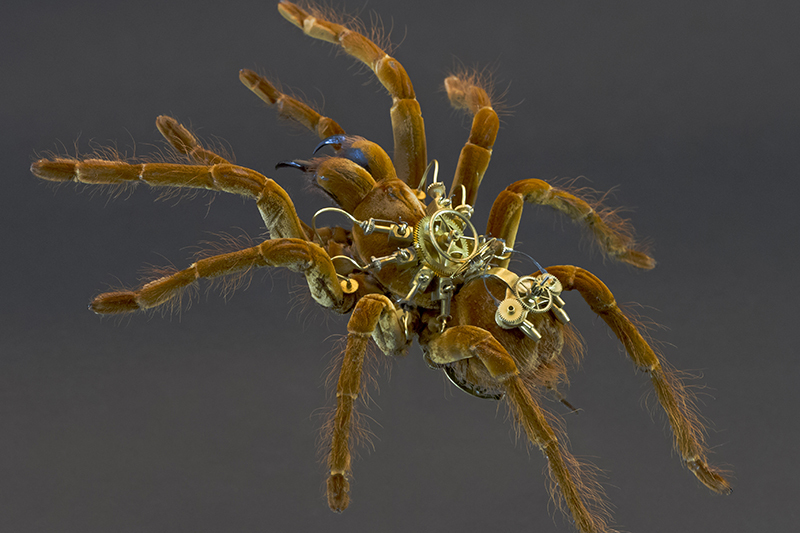 Tiny components from the world of watchmaking and mechanical engineering (gears, plates, springs, etc) are incorporated into the bodies of prepared insects – creating a contardiction that are beautiful bespoke mechanical exoskeleton-clad ‘monsters’. The sculptures of the series MeCre are the end of a long creative process, I always want to deal with themes of individual ethics and humanity´s uninhibited intervention in complex biological systems. I had my first encounter with large insects during a visit to The Evolution Store in New York. I was totally fascinated. 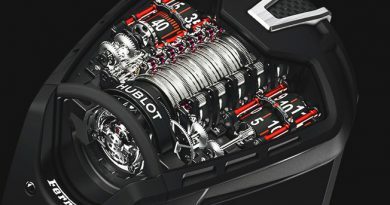 My enthusiasm for kinetic and precision mechanics paired with an artisanal talent did the rest. I built-up many years of experience with the individual trades before the first MeCre was born. Though these experiences, I found my vocation and a perfect platform to visualize my artistic fantasies. What is your criteria for choosing a “subject”? Insects inspire me, they are a marvel of creation. Modifying their bodies is an artistic challenge. They are very fragile beings and extremely difficult to work with. 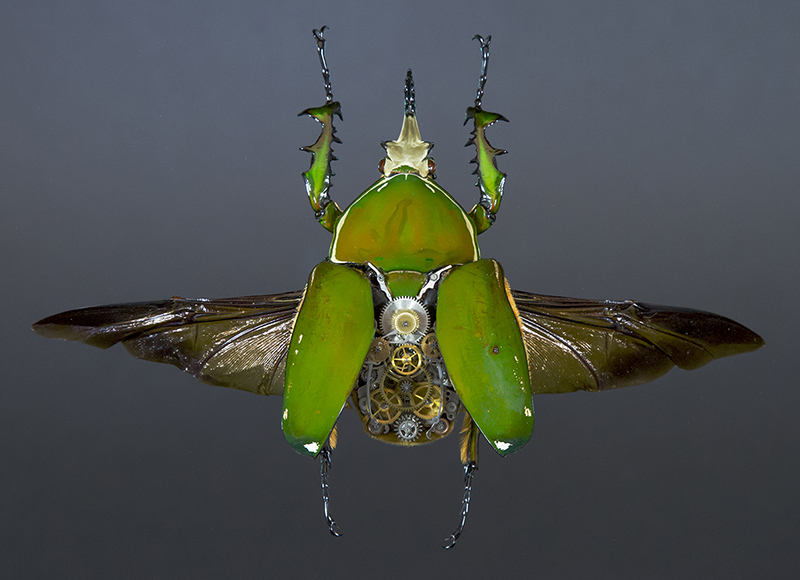 During the transformation, every insect reveals its individual beauty. The technical details and the structure of the exoprosthesis are custom made for every MeCere. What is the message of your art? 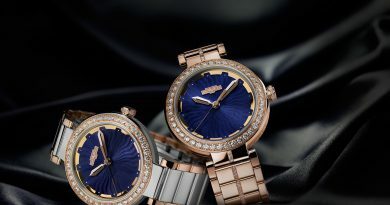 The aesthetic dimension of my works addresses parallels in our perception: watches fascinate us with their mechanical perfection; the intrigue of the perfection of living creatures visible in macrophotography is similarly fascinating to all humans. Both mechanical and living conceptions are perishable and we can interpret the Mechanical Creatures both as a vision into the future and as a look back into the past. I see my works as an aesthetic document of their era. I do not intend to predict the future, I perceive my work as a symbol of the contemporary world, which can be interpreted by the viewer in any way they like. The modern technology becomes increasingly important in our everyday life but I hope it will not supplant the evolution. There is only a small step from mechanically enhanced Lycosa tarantula to a technically enhanced human. The optimization principle is the watchword of our times. 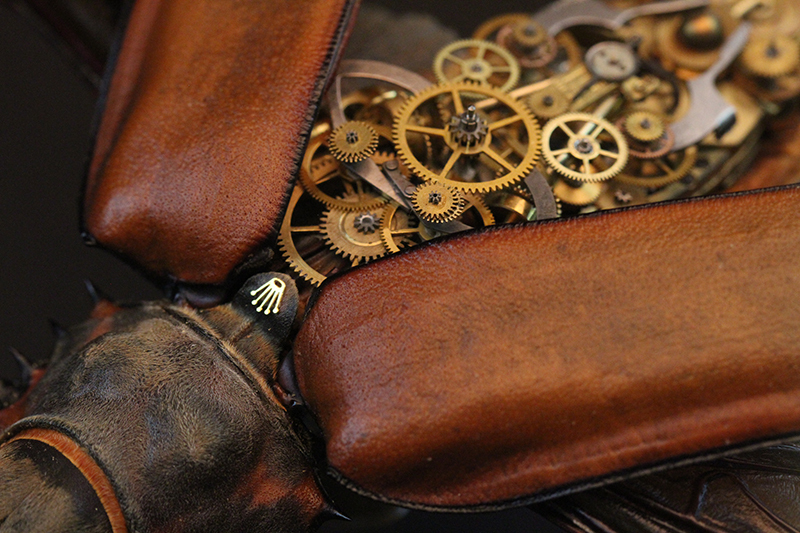 The principles encoded in my work and in the aesthetics of the Steampunk reach increasingly into our everyday world. Humans are connected via the internet and allow themselves to be controlled by ‘wearables’ and apps in order to achieve their own perception of perfection. There is a small step from the “Internet of Things” to the “Internet of Creatures” and I want to encourage the viewer to ponder on the desirability of this kind of future. How much control do we want to surrender and how obsessive is our quest for perfection? How do you source your biological and mechanical materials? I am in contact with good traders all over the world and I am searching a lot across different countries. What is the smallest piece you worked on, and what is the largest? The smallest was a bee, and the largest is currently under development and is a secret. Which insect do you have your eyes on, which as so far eluded you? You can’t just choose what you want to work with – you have to be careful what and how you source (species must be exempt under CITES). Working with other organism, not just insects, gives me a wider range – of course there is a particular process for each. You are tuned and wound to a very busy schedule, yet your delicate art requires a lot of precision and calm. Do you have a routine for adjusting to it and steady your hands? As watchmakers can confirm, you need a calm hand, something so small to add together requires huge endurance. It usually takes a long time to gather the fitting parts for my bio facts, but I always ‘carry’ the image of the finished object in my head. There is a logical structure in the mechanical construction, not necessarily regarding its function but more in the visual realm. I design a machine which should be functional but the aesthetics are important too. There is always a synthesis of both criteria. 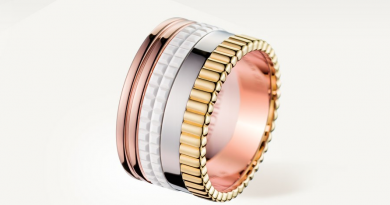 The process can never be assigned as a routine, as everything is handmade and different materials would not lend themselves to standardization – every piece is unique. What’s is the most important item/tool in your studio? There are a lot of important tools but I can’t survive without my tweezers. Do you prefer solo events or sharing the exhibition space? Every exhibition needs a good curator. If its fits my art, I am happy to share the space, but prefer solo events. What is the strangest comment anyone said to you about your art (or question)? I never get strange comments or questions but a simple, yet strong and heart-warming statement from a young child stayed with me: “Art can be also interesting”. What emotions do you go though whilst creating new art? I play with limits of our imagination and fascination. I address the human curiosity with a trace of genuine dread. I want to elicit an emotional response in the viewer. My work is shown in galleries which understand this kind of art – M.A.D.Gallery MB&F In Geneva, Dock Gallery in Rotterdam – to name a few. 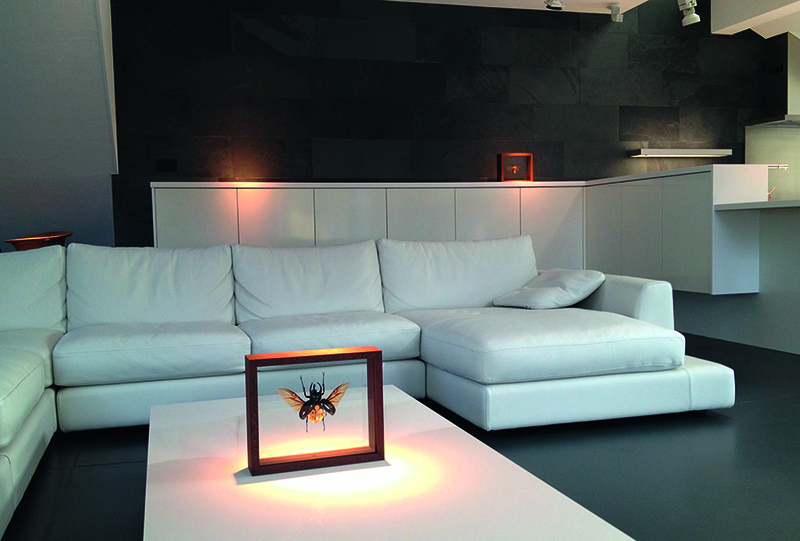 In the process of transformation every insect shows its own beauty, the technical details and the structure of the exoprosthesis are individually customized for every MeCere. All of them are close to my heart. If you ask a plastic surgeon : „Which nose was your best?“ he will always say “the nose that fits best to the client“. Butterflies are probably the hardest work – you can hardly touch them. They are so delicate that it took many attempts until I could build them so perfectly. Every MeCre is a unique piece and an individual cyborg being. 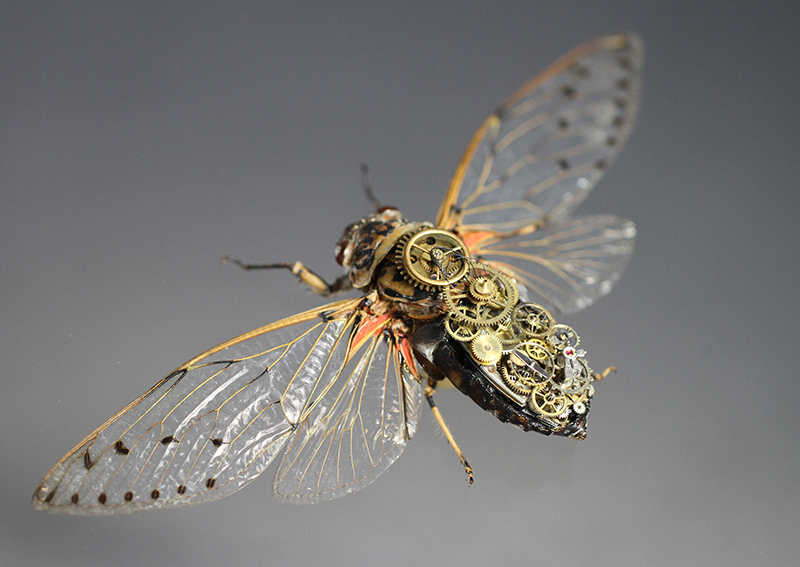 If you built a fully functioning mechanical insect, what would you name it and what kind of an insect would it be (flying, burrowing, etc)? Gaby’s wonderful work is captured in her art book. 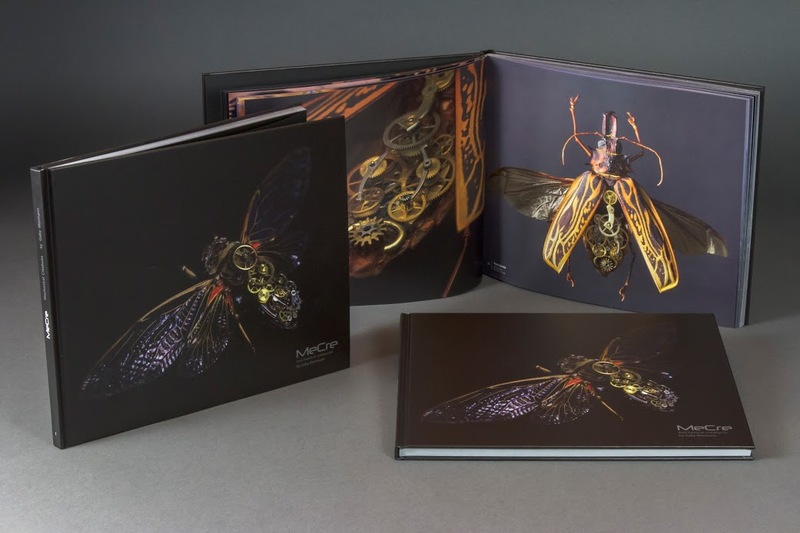 Mechanical Creatures, contains an extensive photographic documentation of her work. 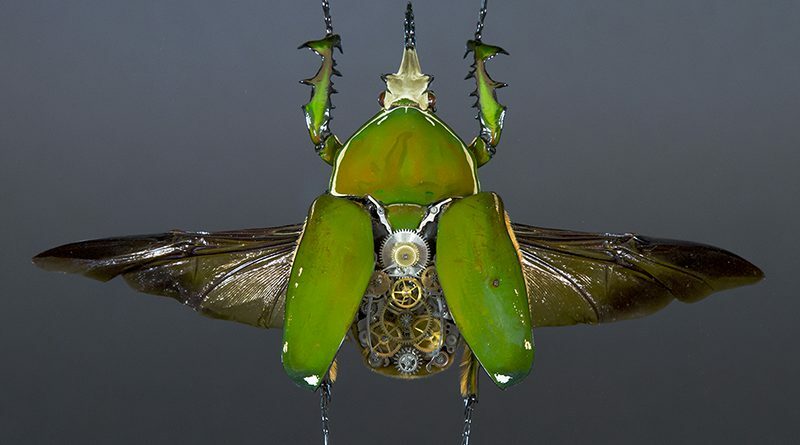 Impressive close-up photographs bring the viewer into the fascinating and bizarre world of her cyber beings created both from biomass and mechanical parts and mutating to an entirely new specie – MeCre. All images reproduced in good faith. Copyright of their respective owners.